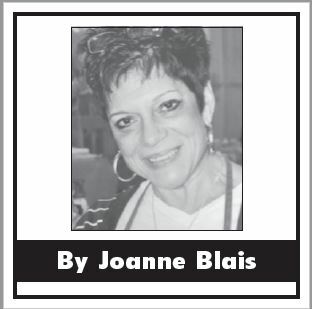 The Scrappy Chef: What’s for Easter? Food should not be complicated or bad or expensive. If you’re needing budget friendly, healthy inspiration as we spring into summer, think… you can make that work. I tend to find single ingredients inspirational and make these super easy and delicious to boot. To save money on sides this year, I’m looking to my pantry without breaking the bank. For a starter, a Spinach Ambrosia Salad, ambrosia meaning “immortality”, food of the Gods. Mix a cup of mini marshmallows, 1/2 cup of shredded coconut, 1 sm. jar of maraschino cherries, drained, (save the juice),1 can of pineapple chunks, drained, (save the juice), 1 can of mandarin oranges (saving the juice). Toss all the above, except the juices with 7 cups of fresh spinach or one large bag, in a large bowl, toss gently and spread on a platter. Take all your reserve juices, add 1/3 cup of orange juice, light handed, add some olive oil and vinegar, mix and drizzle over your greens. For a warm delicious side, Roasted Brussel Sprouts w/Bacon will be a favorite and frequently asked for. You’ll need 4 c. of Brussel Sprouts, 2 tbsp. of chopped garlic, small jar of fire roasted, chopped tomatoes and 3/4 c. of diced Applewood smoked bacon. Wash, trim the sprouts and slice them stem side in half, toss with olive oil and the garlic, add the roasted tomatoes, place in a foil lined cookie sheet and roast, 450~ tossing after 20 minutes, continue until golden brown. Remove from oven add your bacon, salt and pepper to taste, Serve. Yummmm…You can also pay homage to carrots, which are often overlooked. Naturally sweet, they are truly amazing when roasted as well. They are consistently among the cheapest vegetable in the supermarket and the most versatile, you can cut them into coins, chunks, sticks, thick chunks, drizzled with olive oil and garlic and roast them also on a baking sheet for 40-45 minutes. We love rice! It takes a mere 20 minutes on the stove top or the oven (my favorite method) and if there ever was a quick economical dinner idea, it would be rice. I have tried all kinds of rice dishes, baked, fried, instant, in a pouch, in a box. Rice is simple and delicious. It’s eating real food without the hassle or expense and it’s amazing how you can cook it as well. You add milk, it becomes rich and creamy, you add broth, the taste is enhanced, add garlic, mire poix or mixed vegetables, you add water, with butter and some salt whatever combination, it pairs with anything, chicken, beef, sausages, chops, vegetables. A perfect side dish packed with flavor and cheaper than a box for Easter, a Mushroom Pilaf would round out your menu. 2 cups, long grain rice, 3 tbsp. butter, 8 oz. mushrooms, chopped, 1/2 tsp. thyme, 1/2 tsp. sage, 2 c. chicken stock, 2 c. milk, S&P. Spray well, a deep frying pan with a lid, melt gently butter, Sautee the mushrooms until they loose their liquid, add onions, stir for a few minutes, add the rice and Sautee until opaque and slightly brown, about 12-15 minutes. Stir in the spices, add the broth, milk, bring to low boil. Cover pot with aluminum foil and cover with lid, cook on low for about 15 minutes, do not peek inside. Let it sit until ready to serve or at least 20 minutes. Fluff with fork and serve. For dessert, I would recommend this best of both worlds.. 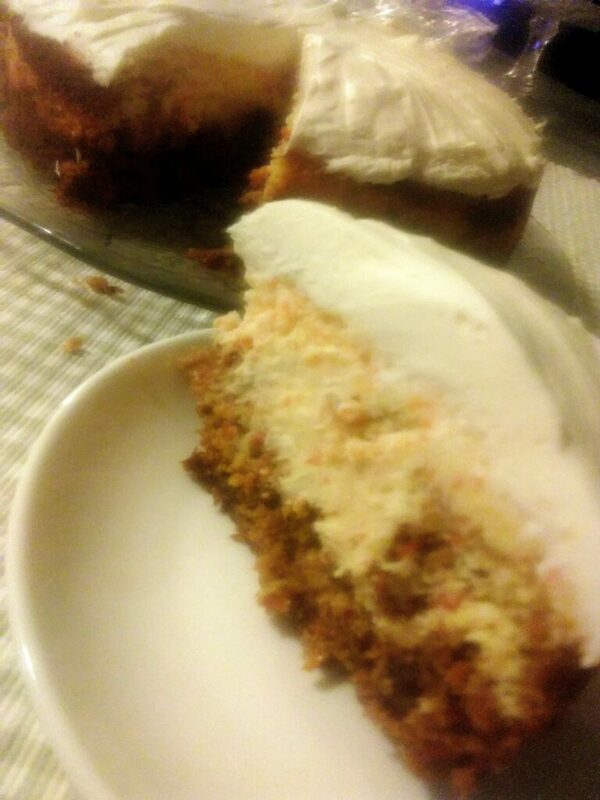 The Carrot Cake Cheesecake 6-8 hours prep time 8 servings. Cake: 2 c. flour, 1/2 white sugar, 1/2 cup brown sugar, 1 tbsp. cinnamon, 1 tsp. kosher salt, 1 tsp. vanilla, 1/2 tsp. orange extract, 1 tsp. baking soda, 1/2 c. applesauce, 1/4 canola oil, 2 large eggs, beaten, 2 1/2 c. grated carrots, 1 tbsp. grated orange, 1/2 c. raisins, 1/2 cup chopped walnuts or pecans. 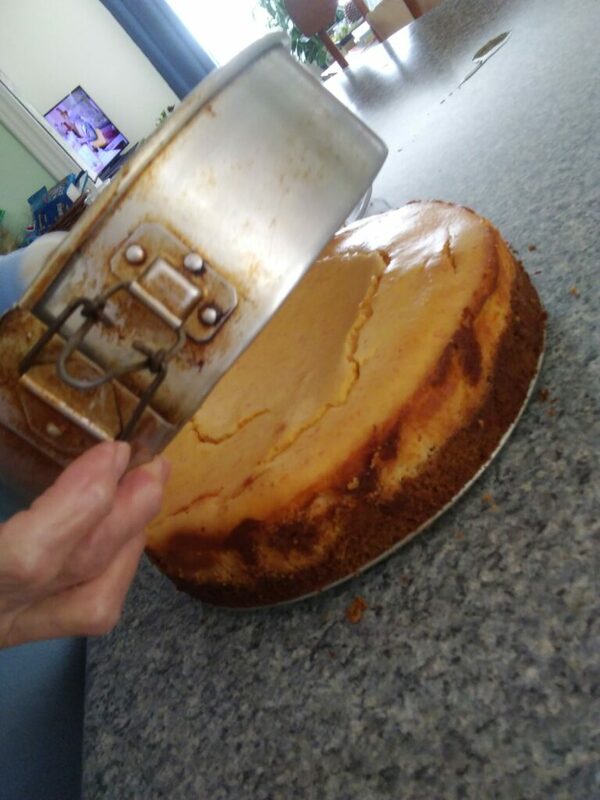 Cheesecake: 2-8 oz. cream cheese, at room temp. 3/4 c. sugar, 1/4 tsp. salt 1 1/2 tbsp. flour 2, lg. eggs, beaten, 1/2 c. sour cream, 1/2 tbs. vanilla, 1 tsp. 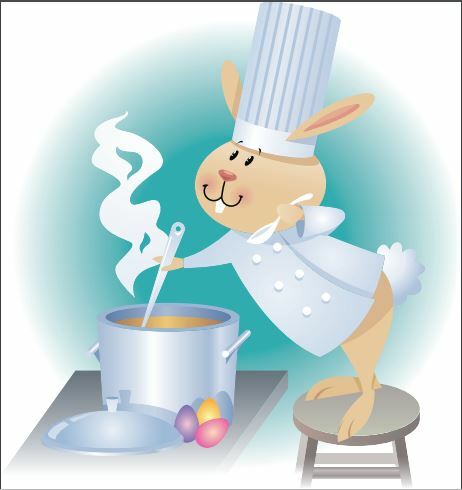 orange extract, 1/2 finely ground carrots….Preheat oven to 350~, Spray well, spring form pan. # 1. Make Cake. In a large bowl, combine flour, sugars, cinnamon, salt, bkg. soda, Stir in oil, add eggs, applesauce, extracts, and mix well. Add carrots, orange rind, raisins, nuts, and mix until combined. #2. Make Cheesecake mix: In Lg. bowl, beat cream cheese, sugar until smooth, stir in salt and flour. Mix in eggs, extracts, beat 1 minute between each addition of sour cream, and carrots. #3. Assemble cake: Pour 2/3 of cake mix in sprayed pan, smooth w/spatula, top with spoonful’s of cream cheese (1/3), pour remainder of cake mix on top, and add cream cheese mix on top, smooth w/spatula. Bake until center is jiggly, about 1 hour, Let cool on rack for one hour and then cool in fridge for 4 hours or overnight. 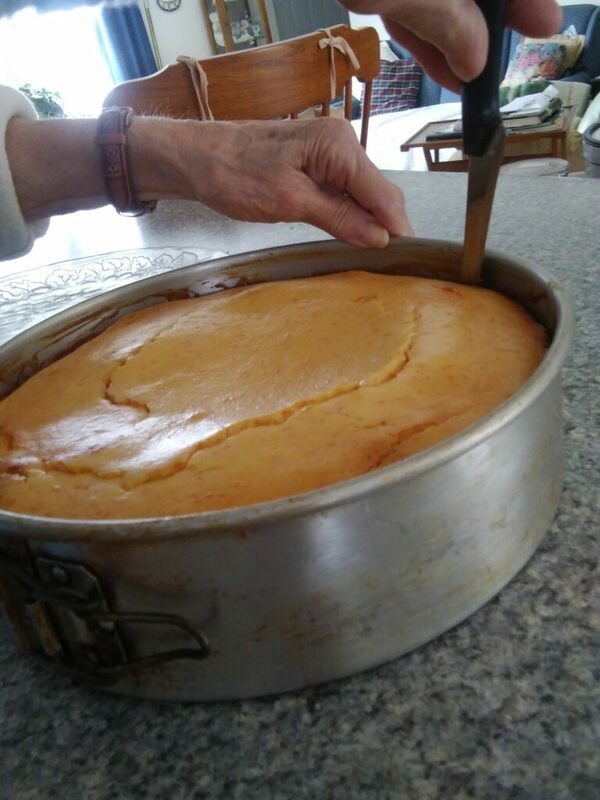 Run a knife around form to loosen cake and unmold from pan. # 4. When ready to serve make frosting, Mix 1 c. confectionary sugar, 4 tbsp., butter, soft, 1-8 oz. bar of cream cheese, 1/2 tsp. vanilla, until smooth. Frost top of cake, garnish with chopped pecans, or walnuts. Chill for 30 minutes to set frosting.